I first started backpacking as a teenager in England. I did a 28-day trip in the Arctic, but most of my backpacking experience has been weekend to 10-day trips, in a range of terrains and climates. 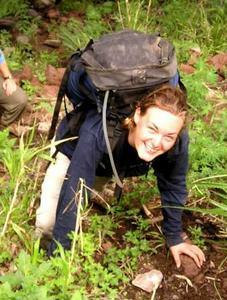 I am a volcanologist so I also do day hikes carrying loaded packs over intense terrain. Nowadays I am generally in sub-tropical climates. I am heading increasingly towards ultralight packing, and unless I am sharing I use a bivy. I try to pack around 20 lb (9 kg) for long weekend trips but have carried over 50 lb (23 kg). This is an ultralight, simply designed dry bag with 50 L (3051 cu in) capacity. It is made from light-weight, bright yellow material. It has a roll-and-snap closure. The material is so light and thin that I can see my hand through it. The bag also comes in two other sizes - 20 L (1220 cu in), which is a grey-green color, and 80 L (4882 cu in), which is orange. My dimensions are measured across the base of the bag, and from the base to the very top. The circumference of the base is about 48 in (122 cm). 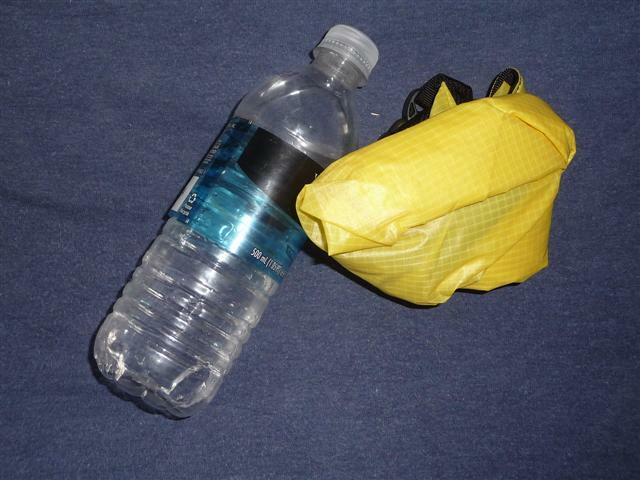 This is an ultralight dry bag made of 40 D (1.1 oz/31g) Ripstop silicone impregnated nylon, according to the website. It has a roll-and-snap closure at the top. 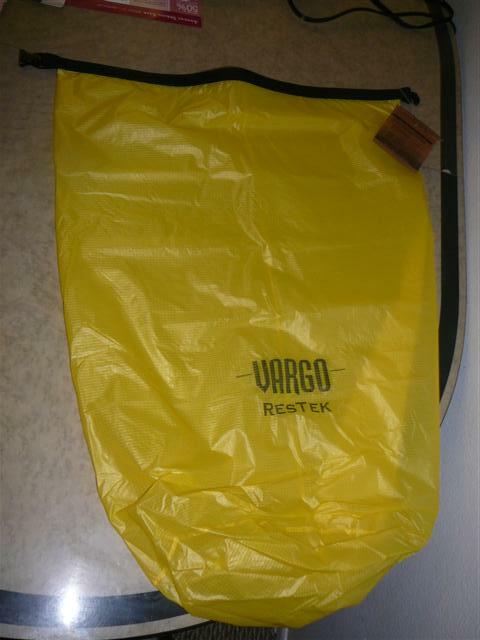 The bag is a bright yellow color with a criss-cross pattern and the words Vargo ResTek printed on it. It is very thin and almost has a plastic bag feel to it. When I put my hand inside I can see it through the bag. 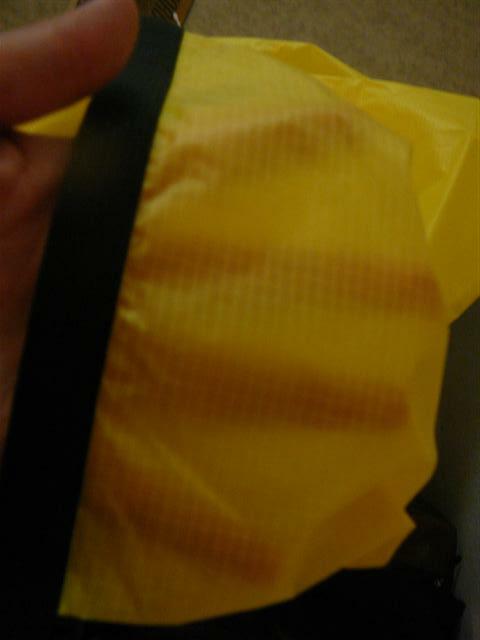 The bottom of the bag is rounded and attached to the walls with taped waterproof seams. The bag arrived with just a cardboard tag attached. This contained the same information as the website, although it listed capacities of 5 L (305 cu in), 15 L (915 cu in) and 25 L (1526 cu in). It also had information about the warranty, lifetime to the original owner against defects. They will replace or repair at the manufacturers discretion. However 'The warranty does not cover damage due to normal wear and tear, damage, accident or the breakdown of color' (quoted from the card). This bag is really, really light. That will make it great for backpacking, but I'm not sure how sturdy it will be. I had a backpack made partially with the same material and ended up sending it back because it tore under the slightest stress. The roll-and-snap closure is also narrower than others I have seen, which may mean that it needs more rolls to be fully waterproof. The color is bright and easy to see and I think the rounded bottom will be nice because the bag will stand up. The size is pretty decent, maybe slightly bigger than I would have chosen. As it is so light I can just roll it a few more times though so I don't think it will be a problem. I think it will fit my sleeping bag (even my big, old, Artic synthetic one) and clothes comfortably. As I have a front loading pack I don't want to use it as a backpack liner, but with a top loading pack it would fulfill that function well. I don't think it would fit everything for a long trip, but it would certainly fit everything that I would want to keep dry. Overall this seems like a pretty standard dry bag, just a very light one! I'm not all that impressed with the information provided by the manufacturer - the actual weight is twice what is listed on the website, and the website shows different capacities to the card. Pretty much everything I have bought has inconsistencies like that, but I think the weight one is pretty bad. When I compared the Vargo bag to my 35 L (2136 cu in) stuff sack it is definitely bigger, so fortunately the card was wrong about the capacities, not the website! To check that the bag was waterproof I initially rolled it up with just air in and put it in my bath tub. I rolled the top just three times and I couldn't see any leaks. The bag floated really well and when I tried to submerge it I couldn't, although a few bubbles did come out of the roll-and-snap closure. When I opened it up the outside of the top was wet, but not the inside. I then put clothes inside the bag and once again it floated with no apparent leaks. We'll see how it fares after a week in my backpack! I use the bag to protect my sleeping bag. I also use the bag to keep my backpack clean when I am packing it. The bag rolls up pretty small. It has got some dirty marks on it that won't come off. I first took the Vargo ResTek Drybag on an 8-day trip out west to Gila National Forest in New Mexico. We did 5 days, 4 nights of backcountry hiking/camping, 1 day of exploring the cliff dwellings, and 3 days of driving to get there and back from Tampa. We hiked about 25 miles, with elevation changes of about 2000 ft (610 m) and 73 river crossings. Temperatures ranged between 25 and 75 F (-4 and 24 C). 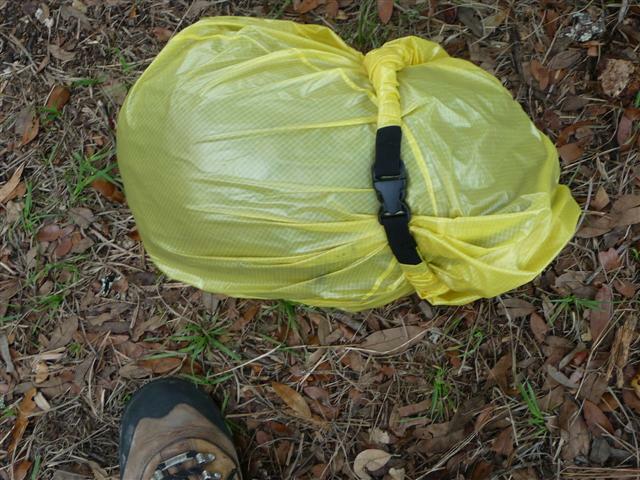 I also used the bag on an overnight hiking trip in Myakka River State Park in west Florida. Temperatures were between 69 and 91 F (21 and 33 C), with severe afternoon thunderstorms. We hiked 11 miles (18 km), passing 5 foot (1.5 m) rattlesnakes, baby gators (but no parents) and so many armadillos! I took the bag on a day kayaking trip also, in central Florida. I am still constantly struck by just how light this bag is. As the material is so thin I initially worried that it would tear, but I have been gradually treating it with less caution and so far no leaks. I have a front loading pack so I found that the best use for the drybag was to protect just my sleeping bag. I tried putting my clothes in there too, but found that that made it harder to fit in my pack. On the trip to Gila National Forest I was in charge of a large group and so would try to get ready really quickly. To save time I just put my sleeping bag inside the drybag and put it in the bottom of my pack without doing it up. I figured that the pressure from the items on top of it would stop it from letting in water for the short time it might be submerged. Its biggest weakness is the reason I didn't do it up - air. There is no way to get air out once I start rolling it, and with a full pack it can take up a lot of extra, needed, space. Therefore I just didn't bother! It still provided me with real peace of mind during the 73 river crossings. For the Floridian trip, where I had more time, I would put my hand around the drybag next to the sleeping bag and twist it to keep the air out. Then I would put three rolls in the top, and let it untwist so I could do it up. This seemed to work pretty well, with only small amounts of air left in there. I would do up the bag around the sleeping bag, so it acted as a compression strap also. I really wish that there was some way to get the air out, but that is a common shortcoming of drybags. I think that this is a great size for a drybag. As it is so light and thin, any extra space can easily be taken up with extra rolls. I still think that it would be fantastic as a backpack liner for a top loading bag. For my front loading pack I discovered that the drybag is the perfect size to lie my backpack on. This was really nice in the mornings, when the ground was wet from dew, rain or snow, as it meant that I could load the front of the bag without getting the back support wet and dirty. Very useful! When not in use the bag rolls up really small and with it buckled on itself to secure it, it is easy to store. 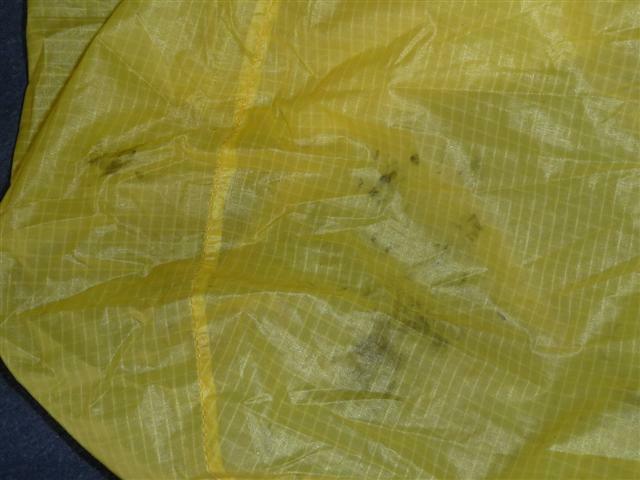 The only other thing that I have noticed about this drybag is that at some point it got some dirty marks on the yellow of the bag. I have not been able to get rid of them no matter what I try. It's purely visual though. Overall I would say that this bag is so light that it is worth taking along on any kind of trip. Other than it being hard to get the air out, the only potential weakness I can see is its strength, but check back for the long term report in two months to see if it has survived my testing! I finally gave up on this bag when it got a hole in it. It wasn't from a sharp object - it just couldn't cope with the wear of being put into my kayak repeatedly. I used the drybag again as a backpacking accessory on a three day whitewater rafting/hiking trip on the Ocoee River and Big Frog Mountain in Tennessee. We hiked 23 miles (37 km) over two days, with elevation changes of over 2000 ft (610 m). Temperatures were between 51 and 78 F (11 and 26 C) with no rain, but an abundance of ticks and no-see-ums. I also used it on two 3-night and three overnight kayaking trips. Temperature ranged between 50 and 95 F (10 and 35 C) with plenty of heavy rain. On the hiking trip the drybag continued to function well as a sleeping-bag protector, although we did not get any rain to really test it. 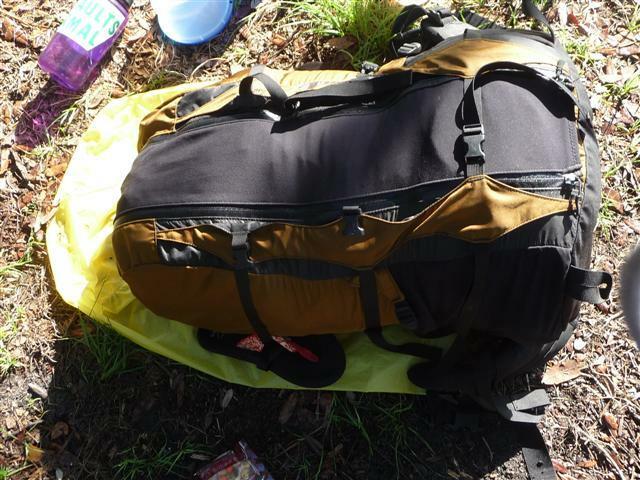 I also still found it useful as a ground cloth for loading my pack. It turned out that it is not at all up to the challenge of kayaking. I have a sit-in kayak that does not have bulkheads so there is no dry storage, but my things are somewhat protected. On the first three-day paddle the bag failed me almost immediately. 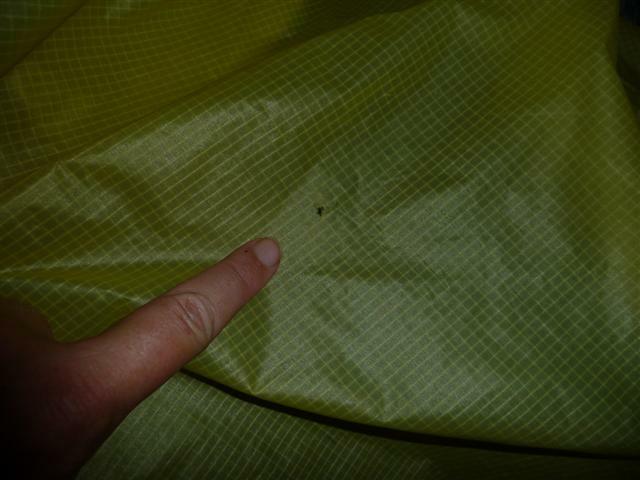 I had maybe an inch (2.5 cm) of water in the bottom of my kayak, and the things inside the bag were totally soaked. They actually seemed wetter than the things that were not in a drybag at all! I moved everything around so that only my unimportant stuff was in the drybag, and tried putting more rolls in the top, more air in there, less air in there, repositioning it within the kayak... all to no avail. The bag did nothing. When I got back to Tampa I emailed the company, and they told me it was designed for keeping the water out backpacking, not for waterproofing during water-sports. They told me that I could try seam-sealing it, or I could replace it with one of their heftier bags. To me, this is therefore not a drybag, it is a backpack liner. I bought seam-sealer, applied it liberally, and departed on my next trip with high hopes. They were speedily dashed! Once again the bag did nothing. I then began using it as an outer and putting my other drybag inside it. This seemed to work well and all of my most important things stayed nice and dry, although it meant drastically reduced dry capacity. Then I noticed a hole in the drybag. I stopped using it until I noticed a hole in my other, sturdier drybag. As that one had been on many trips with me and had had some abuse I was not all that surprised, but quite disappointed. I continued to double-bag my things in the two dry bags, and this still seems to keep the worst off. It does more than the Vargo drybag did without holes! I have basically realized that the rep was right - this is not a drybag at all, it is a backpack liner. For that purpose I think it is really excellent, but it is not designed for any really trying situations, or exposure to the elements. I would tape up the hole and use it to cover my sleeping bag if I was going somewhere with really bad weather, but overall I think that I have discovered that this bag is just not up to the challenge of the kind of use that I want to put a drybag to. The low weight comes at a price! As a lightweight backpack liner this drybag is a great choice, and the capacity is big enough to store everything that needs to be kept dry. It is also a great size to use as a ground cloth for a backpack. However, it is not capable of any conditions harsher than lining a backpack, and leaked severely every time I took it kayaking. As I have a front-loading pack that is (supposedly) waterproof I had hoped that the bag would prove multi-purpose, but that is definitely not the case for this 'drybag'. Mislabeled - it is a backpack liner not a drybag! 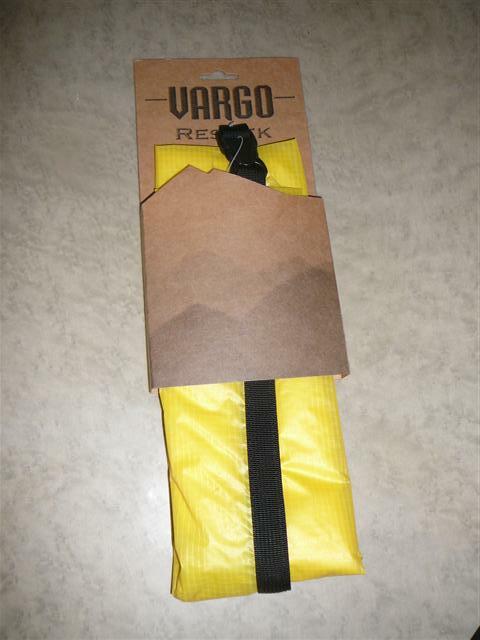 Many thanks to Vargo and to BackpackGearTest.org for the opportunity to test the Vargo ResTek Ultralight drybag.